Who doesn’t love fried chicken? Succulent chicken wings and legs fried to golden-brown perfection. Imagining the satisfying crunch of breading perfectly crisped, and the tang of salt and spices that hits the back of your throat is enough to pique any appetite. Traditionally, the classic, heartwarming dish is associated with Southern cuisine. But today, fried chicken has become one of South Korea’s most popular food exports. Bb.q Chicken is South Korea’s number one food franchise. In February, the food chain opened its first New England location on Harvard Avenue, bringing its signature Korean-style fried chicken to Allston. Started in South Korea in 1995, Bb.q Chicken now exists in 59 countries with more than 4,150 eateries worldwide. Don’t be fooled though—Bb.q doesn’t mean barbecue here. Rather it stands for “best of best quality”. The Allston neighborhood around Harvard Ave. is fast becoming a “little Korea”, with Korean restaurants crowding the area. Bb.q Chicken, however, will have no problem standing out from the crowd with its trademark olive oil fried chicken that has developed a cult following. John Park, the General Manager of Bb.q Chicken Allston, oversees the daily operations of the restaurant. Despite having little to do with choosing the restaurant’s location, Park is confident that Allston is the best neighborhood for Bb.q Chicken’s New England expansion. “Allston was the perfect location because it’s in the middle of all of the schools,” Park said. “I think of Harvard Ave. as a highway for college students”. Korean fried chicken is often characterized by being lighter, crunchier, and more tender than Western-style fried chicken. After the chicken is fried, it’s usually evenly coated in a thin layer of sauce—typically one that’s spicy. 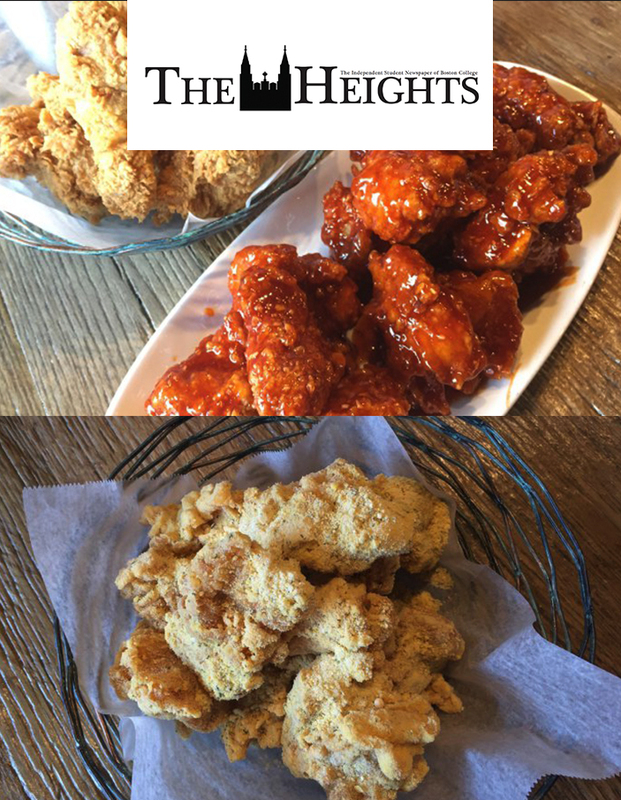 Bb.q Chicken is also known for serving draft beer with its fried chicken, a pairing that has become engrained in Korean culture. In South Korea, these fried chicken joints draw in the late-night crowd looking for a quick bite before heading home. The combination of beer and chicken, called ‘chimaek’ in South Korea, is a compound word connecting chicken, and maekju which translates to beer in English. At Bb.q Chicken, the food is evenly coated in a secret mixture of seasonings, and marinated in the refrigerator for 12 hours. It’s then thoroughly dipped into a thick batter and dropped into a breading solution. The chicken is then lowered slowly into the olive oil for four minutes until it’s perfectly cooked. When it comes time to order, choosing exactly which chicken you really want might seem like a challenge. Start with the Golden Olive Chicken—plain fried chicken showcasing the unique flavours and texture that come with deep frying in olive oil. This signature menu item is lighter than any fried chicken you’ve ever had. But to get the true Korean fried chicken experience, the Secret Sweet Chicken is a must-try. According to Park, it’s most popular dish on the menu. It’s essentially the classic Golden Fried Chicken smothered in a sweet and spicy glaze. For those looking for something out of the ordinary, the Cheezling is boneless pieces of fried chicken coated with savory cheese powder that are unlike any other. Regardless of the chicken that you choose, Park insisted that the best way to devour a plate of fried chicken is to dive into it using your hands. The perfect accompaniment to the decadent fried chicken is diced pickled radish. The acidity of the radish cuts through the richness of the chicken. Park compared it to the way Americans eat pickles with their burgers. The menu at Bb.q Chicken boasts more than just its signature fried chicken. Another popular menu item is the Dukbokki, a stir-fried dish of chewy rice cakes cooked in a spicy chilli sauce. If you are aren’t feeling too adventurous, the sizzling Bulgogi Bibimbap is always a safe bet. Park also explained that take-out has also become a big part of Bb.q Chicken’s business. Luckily, even with time on the road, its fried chicken remains crisp and moist. Once UberEats landed in Boston, Bb.q Chicken began making $1,000 worth of take out on the weekends. Park also noticed a spike in orders on Saturday mornings, revealing that people are eating fried chicken as hangover food. The restaurant is right next door to Wonderbar, the weekend party spot frequented by many Boston College students. Park has debated over keeping the restaurant open until early into the morning, to catch the crowd of hungry partygoers. He mentions that most of his servers are students, and isn’t sure if it’s worth an extra $500 or so. He knows Five Guys makes money on those nights, but also understands that they get in trouble with the police. So for now, Bb.q Chicken will maintain its original hours, closing at a more reasonable 12 a.m. And even though it might be earlier than some of its neighbors, that leaves fried chicken lovers plenty of time to stop in for a bite of crispy chicken. It even leaves time for them to come back for a second round.